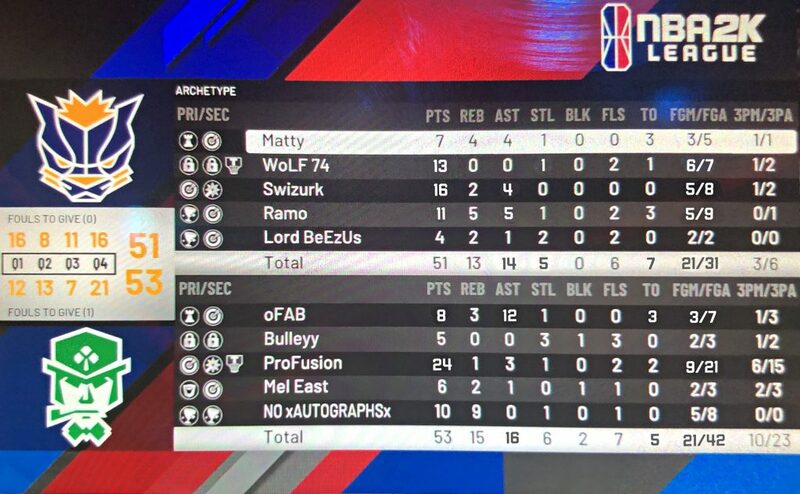 Pacers Gaming (PCG) played Celtics Crossover (CCG) in the quarterfinal of the TIPOFF Tournament. After some admin issues to start, the rest of the game was a lot of Swizurk (PCG) and ProFusion (CCG). Team defense is a staple of both franchises and that was evident throughout the game. For the third time in as many games for PCG, the winner was determined in the final seconds of the game. Ramo had an open three-point shot fall short after a perfect out-of-bounds play with 1.4 seconds left on the clock. Pacers Gaming lost a tough one with a final score of 51-53. Final box score combined after game reset. PCG were led by Swizurk with 16 points, 2 rebounds, and 4 assists while WoLF 74 dropped 13 points shooting 6/7 from the field. Matty had a well-rounded attack with 7 points, 4 rebounds, and 4 assists. Ramo had another big game dropping 11 points, with 5 rebounds and 5 assists. For CCG, ProFusion led their scoring with 24 points. NOxAUTOGRAPHSx had 10 points and 9 rebounds. Tune in Wednesday, April 10th to watch Pacers Gaming take on Jazz Gaming at 6 PM EST on https://www.twitch.tv/nba2kleague.